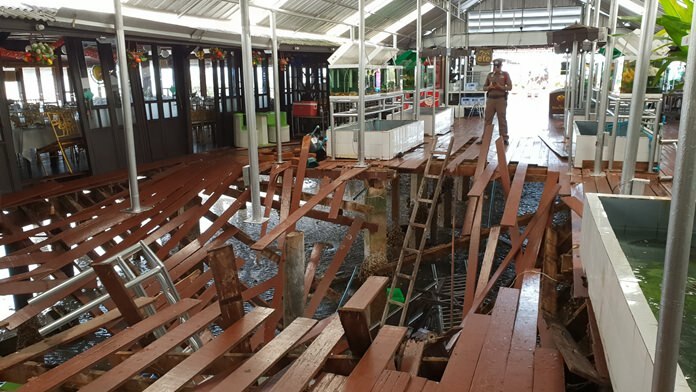 The owner of a Bang Saray restaurant where 29 people were hurt when its wooden floor collapsed may face charges for poorly maintaining the eatery sitting three meters above the water. Patcharin Osataphan, owner of Ruantalay Bangsaray, met with police investigators July 13, a few hours after 70 guests fell through the 6-by-11-meter hole that opened up in the restaurants main concourse. Of the 70, 41 fell 2.6 meters to a sandy beach while 29 ended up in the water. Sawang Rojana Thamma­sathan Foundation rescuers spent 30 minutes pulling all the victims to safety and transporting them to three area hospitals. Injuries ranged from cuts to broken bones. The victims were part of a group of 200 workers from Buriram Sugar PLC who had come to the Sattahip sub-district for a day at the beach and a seafood lunch. Witnesses said the group was making its way to their tables when some stopped to look at a large aquarium. Suddenly the floor caved in. Bang Saray officials said the restaurant’s wooden floors and beams were old and poorly maintained.